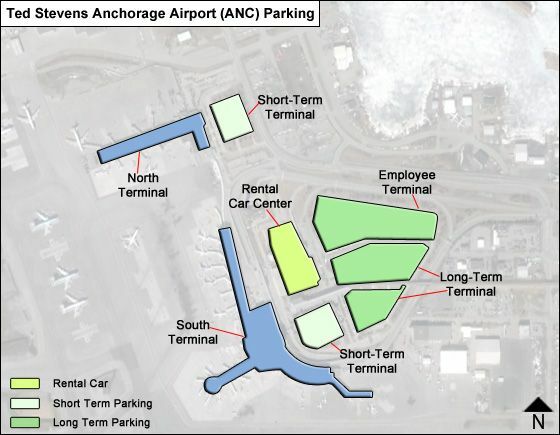 Cell Phone Parking Lot If you pick up passengers at Ted Stevens Anchorage International Airport there is now a free Cell Phone Lot available for drivers to wait until arriving passengers have deplaned, collected luggage and called to be picked up outside Baggage Claim. The Cell Phone Lot is in a designated area of the DOTPF Central Region Headquarters parking lot - just two-minutes away from both the South and North Terminals. There are 15 parking spots available Mo-Fri, 7:30am to 5:00pm, and more than 30 spots during the evening and on weekends. Directions to the Cell Phone Lot: From International Airport Road, turn right at the Aviation Avenue Exit and follow signs to lot. Drivers must stay with their vehicles. There is no parking or waiting allowed on the airport roadway shoulders. For further information, call Republic Parking at 907-243-1532. Monthly prepaid rates are also available. Directions to the Park, Ride & Fly Lot: From westbound on International Airport Road, turn right at the Aviation Avenue Exit and follow the signs to the parking lot.